Denver DUI Attorney & Car Accident Lawyer Slip and Fall Accidents - Who's At Fault? Everyone knows that moment when you feel like you are going to slip or fall – you grasp for anything to help break your fall and you feel like your life is flashing before your very eyes. Not everyone is so lucky to prevent or cushion their fall. 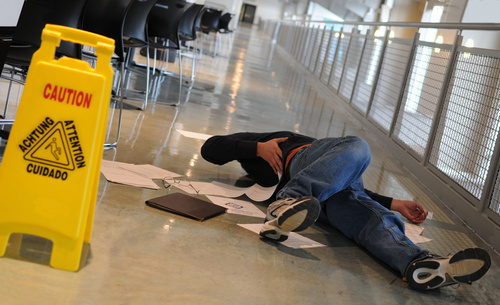 Slip and fall accidents can cause serious injuries to people of all ages. Many people also do not realize that someone, whether a person or a third-party, is responsible for their fall. Below we will take a look at various locations a person may slip or fall, and who the at-fault party often may be. All of these may cause a slip or fall to occur, and it is the duty of the business to not only know when these hazards are present but also to properly sign and warn others to be cautious. If you slip on the property of a business, the at-fault party will almost always be that business. While it is never easy to tell someone that it is essentially their fault that you were injured, it helps clients to know what happens when they file a slip or fall lawsuit. They are technically going to receive compensation from the at-fault party’s insurance, not necessarily directly out of their own pocket. Sometimes that is the case, but not always. The construction industry is the most notable workplace where slip and fall accidents occur. Oftentimes, this may be due to improper training. If a person is unaware of the protocols and tools they need in order to remain safe on the job, fault for their slip or fall could fall into a number of people’s hands. On one hand it could be their manager or the person that was responsible for training them. On the other hand it could fall on the business’ lap if there were no plans in line to train the new employee on safety hazards. If you or a loved has been in a slip or fall accident in New Mexico, do not hesitate to call our offices of Jarrett J. Benson Law. It is our goal to assist you and your family to receive the best possible outcome of your case with solid and trustworthy representation.